on 08 June 2011 . FROM AUSTRIA - ÖCIG - “Cochlear implants – possibilities and borders“. FROM THE UK - ‘Let’s Get Started!’ Listening Games for families and their cochlear implanted babies and toddlers. We delayed this issue so that some news and photographs from Innsbruck could be included. It was a wonderful event thanks to our hosts CIA and MED-EL who generously sponsored the meeting. Fourteen member countries were represented. We look forward to your contributions for the next newsletter especially news from member countries. In July 2011, The Ear Foundation is organising the first summer camp for teenagers with cochlear implants at St John’s School for the Deaf, near York in the UK, and EuroCIUsers’ Group has kindly agreed to support this. To date we have 24 teenagers from 6 countries (Belgium, Norway, Finland, Northern Ireland, Turkey and the UK) with accompanying adults booked to join us there for a week of activities, designed to promote confidence, independence, communication and English skills – as well as fun! FEAPDA (Fédération Européenne d'Associations de Professeurs de Déficients Auditifs (European Federation of Associations of Teachers of the Deaf) exists to allow Teachers of the Deaf from across Europe to play a more active role in discussions about the education of deaf children and young people and more effectively than in the big international congresses. The federation holds a Congress every two years and it includes both keynote speakers and country presentations. The next congress takes place on October 20th to 22nd October at Sint-Michielsgestel in the Netherlands, an institution steeped in the history of European, and indeed world-wide, education of deaf children. The topic is literacy with specific emphasis on reading. The keynote speakers are Ingvild Roald (Norway), Carin Roos (Sweden), Linda Watson (UK) and Loes Wauters PhD (Netherlands). Gilles Cognat, President, welcomed the delegates who came from 14 member countries. He said that the total number of implants done within the countries belonging to EURO-CIU was now 79,000. After many years as General Secretary, Ruud decided to step down from the Board of EURO-CIU. Before the end of the meeting he was thanked for all the work he had done and presented with gifts which came with best wishes on his retirement. Members were delighted that Ruud has agreed to continue with his annual survey of CIs in member countries. 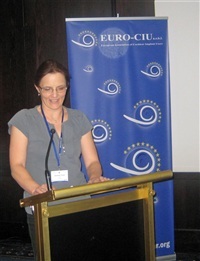 Sari Hirvonen-Skarbö of Finland was elected as the new Secretary of EURO-CIU. "I am grateful that you have elected me secretary and thank you for welcoming me to EURO-CIU Board. I see this as a challenging but very interesting position of trust and I want to do my best. "I got my CI seven years ago. I´m member of CITO board in Finland, which plans and organizes seminars and week-ends for CI adult users and for those who are considering having a CI operation. An important part of CITO work is to provide opportunities for peer support. It also promotes advocacy for getting a better resources for rehabilitation in Finland. CITO is part of Kuuloliitto, the Finnish Federation of Hard of Hearing (FFHOH). "I graduated from Helsinki University, major in Art History (MA). I am married and have three sons. The oldest one is hard of hearing and wears BAHA hearing aid but he is in mainstream education. We live in Espoo City, which is near the capital of Finland, Helsinki." The symposium took place in the beautiful town of Innsbruck in the heart of the Austrian Alps on 29th April 2011. Innsbruck is the home of MED-EL which generously sponsored the symposium and the EURO-CIU General Assembly. All members of EURO-CIU who were going to the Assembly the next day were invited to attend. We were welcomed by Prof. Dr. W.D. Baumgartner, Head of the Department of Otology and Implants, Vienna General Hospital, Dr. Gilles Cognat, President EURO-CIU, Prof. Dr. Patrick Zorowka, Director of the Department of the Department of ENT and Hearing, Speech & Voice Disorders, Medical University Innsbruck and some Austrian CI users. We were fortunate to be able to attend as the meeting with participants from 21 countries had been oversubscribed. Prof. Dr. George Sprinzl (Innsbruck University) spoke about ‘Modern minimally invasive cochlear implantation’. He said he had done 180 implants in the last four years and his patients had an age range from 11 months to 78 years of age. Most of the implants were on children so minimally invasive surgery as well as safe and reliable surgery was very important as they had a long life expectancy and, at some stage, would need to change their implants though reliability was not a major factor as only 1% malfunction. There had been big technological improvements: the Sonato implant systems were 25% thinner and 250% impact resistant. Surgical times had been reduced from three hours to one and needed only a very small incision. The tiny electrode needed no ‘tie down’ which together with the small incision made for a rapid recovery. A diamond burr was used to drill a small hole and there had been a return to the round window techniques as opposed to cochleostomy, especially where hearing was to be preserved, as better electrodes meant there was no risk to the facial nerve. The electrodes had to be right for the patient; they could be medium, compressed of split and there were also standard and flexible electrode arrays to choose from. Prof. Dr. Baumgartner’s presentation was entitled ‘Hearing preservation’. He spoke about the use of electro acoustical stimulation (EAS) in patients with good preservation of hearing in the low frequencies but very poor hearing in the middle and high frequencies. The first EAS was done in 1999. The combination of a cochlear implant and a hearing aid with acoustically useable hearing in the low frequencies allows patients with 45% speech understanding to increase it to 70%. Minimal invasive surgery is used as well as round window insertion. In 94% of the patients hearing was preserved but in 6% it was lost within two years. If EAS is used with a bilateral cochlear implant the period of adjustment is longer. The electrode arrays used when hearing is to be preserved are 18-23mm. The cochlea is 35mm and when there is complete insertion with 0.2mm slim electrodes the insertion is 31-32mm. Dr Bernhard Laback of the Acoustics Research Institute, Vienna spoke on the subject of three dimensional hearing in cochlear implants; horizontal (left/right); vertical (up/down) and dimension in space. Horizontal spatial hearing is not good even with bilateral implants as they do not pick up temporal information which is necessary for this. There were also presentations on stem cell research in relation to the inner ear, genetics of hearing impairment, auditory training for adults and various educational issues concerning children in mainstream education including testing the achievements of hearing impaired children while at school. Two cochlear implant users gave an account of their experiences with bilateral implants and cochlear implantation after 40 years of complete deafness. Following the Symposium we were treated to a guided tour of the Hofburg with all its great pictures of the imperial family. After this there was a splendid gala dinner in the Gothic Cellar of the Hofburg. When I became a member of ÖCIG in 1999, I did not know that the EURO-CIU existed. Only many years later, actually only after the death of Franz Wimmer, the founder of the ÖCIG and the Co-founder of EURO-CIU, did I get in touch with the name, EURO-CIU, again and again without really noticing its significance. I was too much occupied with my CI and my newly recovered auditory sensation. Over time, after my life-quality extremely improved because of my CI, I started to actively participate in our organization (ÖCIG), which I have very much to thank for. The start turned out to be very difficult for all involved. We missed our founder Franz Wimmer, who knew every single person affected, who also had the time to take care of the entire organization and everything beyond it. His sudden death in 2003 was way too soon. By chance we got the membership list but we faced the problem of who will continue leading this association and especially how. Franz Jank, whose daughter Veronica had got a CI in childhood, in spite full employment offered to take over the position as the Associations President. He did and still does his best, he has held ÖCIG ski holidays for many years now in Altaussee, where families with CI children and teenagers in particular like to participate. In Franz’s memory there are also the summer holidays for the affected and friends at the Neusiedlersee in Burgenland, where sailing, sports and games are in the foreground. He also always tries to be a contact person for those affected, their families and friends to answer any questions regarding the CI. This year, the ÖCIG held their 3rd Symposium, this time about “CI capabilities and limitations” in Vienna. In the morning, an interdisciplinary group of speakers from home and abroad spoke about medical, educational, psychological and technical priorities. After lunch the topics were specific technical tools for CI-wearers tailored to the different basic technical aids (CI and hearing aids). The focus was on the use of FM systems and mobile phones. The CI manufacturers were also invited and made presentations and had Information booths. Thanks to sign language interpreters, note takers and t-loop, people with hearing impairment were also able to follow the presentations. 130 participants made the event a complete success. In the past two years we have succeeded in supporting Franz Jank and helped, slowly but steadily, to rebuild the association. For the past two years, Magdalena Öttl, Master of Psychology, and I have been working actively in ÖCIG team. Together we have managed to build an information center at the ENT-clinic at Salzburg for those affected, families and interested people. We are happy whenever we can share our experience with others. We offer help in all areas around the CI and we can be sure of the support from the clinicians, the engineer, the psychologist, the speech therapist and of course the head of the HNO-department Prof. Gerd Rasp. We try at events, symposiums – as recently in Vienna – to provide new and important information about the CI and to promote personal contacts with CI users and those who want to have a CI. There is also the “young team” now, led by Lukas Ertl, who will try to increase the promotion of joint activities in the future. At the first meeting of adult CI users, who were either waiting to have an implant or who just had their operation, many questions were asked. A repetition of such meetings is planned. The latest offer to our members is CI-batteries at a very reasonable price. I took over the shipping and I can thus keep contact with our members. Now we want to expand and strengthen our contacts with other associations. The first step was to re-activate the EURO-CIU membership. The work and the size of the EURO-CIU are still largely unknown to us personally and we have to try now to slowly grow into it to be active there. We want to take our time in the first year of our membership to get to know the organization and the members better. We will try to attend various events and to share and trade our experiences. Our aim here is to learn new things so that we can also share these experiences with our members. I am pleased that the ÖCIG is now again a member of the EURO-CIU and I also look forward to working with all the Associations. On the 19th of March, 2011 there took place in Vienna the 3rd symposium of the ÖCIG with the subject “Cochlear implants – possibilities and borders“. “The OP (operation) – what it means for the patient“, a talk from the board of directors of the University Hospital of Salzburg, Mr. Prof. Rasp, was held. Then Prof. Dr. Manfred Hintermair reported on what cochlear-implanted children and their families need for a successful development. An entertaining progress report about her life with the CI, and how her family manage with it, brought Malvina Kohn which put everybody in her spell with her refreshing manner. An exceedingly interesting talk on the first adaptation with toddlers from educational and technical view brought two ladies – Dipl. Audiopedagogue Ulrike Rülicke and Audioengineer Mag. Alois Mair. At lunch all participants were very well supplied with excellent food. The subjects of the afternoon dealt mainly with technical matters, additional devices, aids and their financing. On that subject, Georg Schweighofer reported about the VOX association and Immo Ress of “Advanced Bionics”. Ingrid Hauer from “Cochlear” spoke of the Nucleus 5 systems which is already about a year in the market. Everyone could find out in the exhibition stand of the representing companies extensively about all the aids and test them, perhaps. Mr. Alfred Sturma, a professional first class in the construction of ring pipelines (loop system) for inductive hearing interested the listeners with an interesting report on his work. Two affected people, Mag.a Magdalena Öttl and Elisabeth Reidl rounded the afternoon programme with their experiences with various technical aids. At the end all questions of the participants were answered satisfactorily. The Nordic Summer Week for the Late-Deafened and CI users in Finland, Turku 4th to 10th July 2011. It is Finland FHOH’s turn to arrange the Nordic Summer Week which Is to be held in Christian College of Turku. The programme includes sightseeing tours to Turku, Naantali (where the Moomins live) and a bus trip to the beautiful archipelago. As a part of Finnish culture there is sauna in the evenings. The Finnish-Swedish HoH organisations will introduce their project about making culture more accessible for the hard of hearing. On Friday 8th there is a day for CI users. It includes a lecture about bilateral researches made by Ville Sivonen. Joanna Brachmaier from Austria will speak about her experiences with music therapy and she also practices music with CI users. The languages used will be Norwegian/Danish/Swedish/Finnish and there will be speech- to- text support in Swedish and Finnish. The cost of summer week with board and lodging is 400 €. Staying one day costs 50 € with meals. The right to hear well – is the topic of this seminar. Orivesi college is situated in the middle of Finland. There are lectures and discussions about bilateral CI, testing and activating of CI. The speech therapist Sari Wikman will speak about CI children and their language development and the challenges as well as how to support the development of their language in everyday life. A magician will make visit which will be very exciting for the audience. There will be a General Meeting of CITO. The 6th German CI-Day was held on 24th May 2011 with the motto ‘Ja – Horën! Selbstbewusst kommunizieren!’ (Yes – hearing! Communicate confidently!). On 28th May it became the motto throughout Germany. More than 60 organizations celebrated the chance of the sense of hearing being restored to the people who could benefit from a cochlear implant. The cochlear implant is an internal prosthesis through which born deaf children learn to hear and speak and young deafened people and adults can hear and understand. 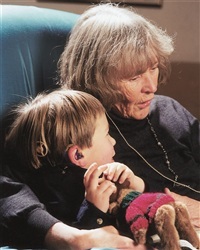 Since 1984 30,000 children and adults have been fitted with cochlear implants in Germany. On the German CI-Day the German Cochlear Implant Association (DCIG) and its affiliated regional associations publicised the importance of cochlear implants and their impact on life. The 6th German CI –Day is sponsored by the Commissioner of the Federal Government for Patients (Wolfgang Zöller CSU) . On 28th May 2011 more than 60 organisations throughout Germany – self help groups, CI clinics, rehabilitation centres and others – explained the problems of deaf and hard of hearing people to the world of the hearing. The programme included information stands and presentations, children’s parties and many other activities. Publicity about the possibility of regaining the sense of hearing with CIs and drawing attention to this was started by DCIG with a balloon launch. Punctually at noon more than 60 organisations released balloons with words ‘Deaf but nevertheless hearing’ printed on them. They had a label attached that not only described how born deaf children and deafened young people and adults regain their hearing with CIs but those finding them also had a chance of winning a balloon flight. Federación AICE has approved to present the candidature of Professor Graeme Clark to the Prince of Asturias Awards, in the category of Technical and Scientific Research. These awards were created to encouraging and promoting the scientific, cultural and humanistic values that form part of mankind’s universal heritage. AICE contacted Professor Clark to give his approval to tabling the candidature. He sent to the association a letter where it was said that he was delighted and very grateful for this. AICE hopes to not only show its respect to Professor Clark and the work of his life, but also raise awareness of the cochlear implant to the press and society in general. We want to show how this technology has changed the deaf world. In Barcelona, on February 19th there was a ‘calçotada’, a traditional Catalonian meal based on the calçots (a kind of onion), in AICE’s headquarters with more than 25 assistants, who shared laughs and good vibes. Then, on February 27th, we went to mNACTEC, the Museum of Science and Technology of Catalonia, to visit the exhibition called ‘Inaudito’ sponsored by Gaes. It showed how the auditory system works, in a pleasant and easily understandable way. In Madrid, on February 25th, there took place a conference about accessibility to information in the Spanish ENT Society headquarters. More than 60 people shared experiences about this subject. In Castilla la Mancha, on February 25th, a group of children read their tales about Cochlear Implant. They were part of a workshop held in the library the week before. To end the celebrations, they shared a hot chocolate with churros. In Asturias, on February 26th, one hundred people went to Talasoponiente Health Resort in Gijón. While the kids enjoyed the pools, adults attended a conference on Cochlear Implant history and on the elimination of communication barriers. In Zaragoza, on February 26th, another group of hundred persons went to the River Aquarium. Apart from enjoying the aquarium facilities, there was a lecture and everyone learned a little more about cochlear implants. In Valencia, on February 26th, almost 90 people visited a ‘ninot’ with a Cochlear Implant, which was part of a falla from Joaquín Costa Burriana. The Fallas festivities welcome the spring with bonfires, music and gunpowder. 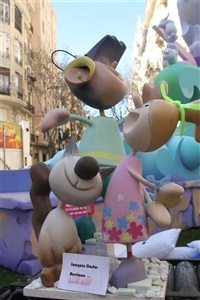 A Falla is a huge float destined for the bonfire and is a satirical piece of art. After that, they shared a paella and attended the various conferences that were held. Reform of the NHS is a topical subject in the UK, and UK Council on Deafness (UKCoD) ran a popular conference with some excellent speakers talking about what the reforms will mean for Audiology and Access. All seats were taken, and there was a waiting list for cancellations. Keynote Speaker was Stephen Lloyd MP (Eastbourne) who is deaf, and who has recently been elected as a Vice Chairman of the All Party Parliamentary Group on Deafness. Other speakers included Prof Adrian Davis (National Lead Adviser for Physiological Sciences and Audiology, DoH), Jackie Ballard (RNID), Jane Shaw (CEO Action for Deafness) [Jane is also a member of NCIUA’s Executive Committee], Ruth Thomsen (President British Academy of Audiology), Jim Edwards (CEO Signature), Steve Powell (CEO SignHealth) and Sue Archbold (CEO The Ear Foundation). 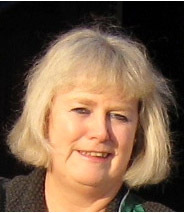 Sue ran a Workshop entitled “Choice & Control – Implications for Cochlear Implant and specialist services. 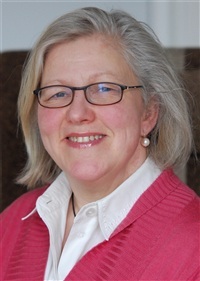 What will remain in the future.” The week following the conference, Sue Archbold was invited to the House of Commons by the All Party Parliamentary Group on Deafness to speak on Newborn Hearing Screening and cochlear implantation. UKCoD was grateful for sponsorship from Advanced Bionics, MED-EL and Oticon. ‘Let’s Get Started!’ was produced in response to implanting children younger and bilaterally. It is a guide to help parents and families of cochlear implanted babies and toddlers to learn to listen through everyday activities. It comprises a book supported by a DVD which demonstrates the activities in the book. The suggested range of games and activities will encourage the child to listen and have fun at the same time. Working with babies and toddlers is often difficult as they are not always compliant. ‘Lets Get Started!’ encourages parents to take the physical and social needs of the child into account by adapting their activities to match the child’s needs. This resource suggests a range of activities which include making musical instruments at home, playing games with your voice, playing with different noisy toys, music and action rhymes. It goes on to encourage the child to make different sounds when they are playing and suggest games that give parents the opportunity to add conversation to daily routine. Sharing books and matching activities are also discussed. Parents are children’s first and best teachers and for these implanted children the family network is particularly important as the primary support. Implant centres should recognise the skills and strengths and needs of different families making full use of the parents’ knowledge of their own child. The aim of ‘Lets Get Started!’ is to provide a resource that is flexible enough to respond to different family dynamics and it can therefore involve the whole family including siblings and grandparents. In order to understand that their child is making progress parents need to understand the different levels of listening skills. The book can be used as a starting point for a discussion about what their child is likely to do in the early days of implantation. This will enable parents to have realistic expectations about their child’s progress. The book encourages learning to listen through everyday activities and daily routines. It encourages listening to environmental sounds and gives a suggested list of sounds. Learning to listen will be more effective if it is linked to play and meaningful activities and the suggested games support this. ‘Lets Get Started!’ is not a programme to be followed but a guide to help parents, it has a flexible approach and the family can change and adapt the games to suit the needs of the child. Parents play a vital role in the development of their child’s listening progress. The guide encourages parents and families to communicate with their cochlear implanted child through activities integrated into their everyday life. This gives them the confidence to take an active part in the development of speaking and listening. AB UK are proud to announce Moving On has been nominated in the Advancing Healthcare Awards 2011, under the category of AHPs and Healthcare Scientists – Leading Together on Health. Representatives from 22 organisations gathered at Cambridge Professional development Centre on 15th October 2010 to host a conference-style ‘Moving On’ event for 48 hearing-impaired adolescents in East Anglia. Devised by the Cambridgeshire-based Hearing Impaired Teenagers (HIT) Support Team, Moving On aimed to ease the transition from paediatric to adult services. Activities in the main conference and three breakout rooms aimed to help the participants to gain confidence in understanding their hearing loss and equipment; obtain information about the choices available for future career paths or college applications; become aware of how to access a variety of support agencies; and meet new hearing-impaired peers. Exhibitors in the ‘Independent living’ room – including the National Deaf Children’s Society (NDCS), Connevans, the Emmeline Centre for Hearing Implants and Addenbrookes Hospital Audiology Department – provided information on topics including equipment maintenance, accessing support and socialising with peers. The ‘Financial support’ room involved representatives from ‘High Street’ banks, the Citizens Advice Bureau and the NDCS. The ‘Education and employment choices’ room featured exhibitors from local further education colleges, Connexions and Job Centre Plus. Participants’ feedback was overwhelmingly positive and demonstrated the significant benefit of multidisciplinary working across a range of specialties. The HIT Support Team involves representatives from the Emmeline Centre, Addenbrookes Hospital Audiology Department, the NDCS, Connexions, and local social services and educational teams. Ruud's presentation will be published in a separate EURO-CIU Newsletter Supplement, which will be sent to you very soon. Advanced Bionics, the leading manufacturer of cochlear implants, aims to help deaf and hearing-impaired people to lead an independent life again by helping them to hear. It will be sent by e-mail and will be available in English, German, French and Dutch, with many other languages to follow shortly. You can even follow up on the ABInsight Facebook page to get all the latest news in between the release of issues. Advanced Bionics is pleased to introduce the Harmony™ behind-the-ear (BTE) sound processor for C1.0 and C1.2 cochlear implant recipients. Harmony is AB’s most sophisticated sound processing system, designed to deliver the best hearing experience possible. Superior hearing with Harmony can translate into better learning, stronger connections with family and friends, and a fuller appreciation of life’s incredible soundtrack. The Harmony for C1.0 and C1.2 recipients will be available in Europe with the launch of SoundWave 2.0 fitting software. In anticipation of the release, a number of centres in Europe have had the opportunity to take part in the first phase of Harmony upgrades for C1 recipients using a special software release. This has enabled over 350 users to successfully upgrade to Harmony in Europe. C1 sound-processing strategies (CIS, MPS, SAS) are all supported by Harmony, providing an easier upgrade with numerous advantages. Users are able to benefit from improved front-end processing in the sound processor, while the separate volume and program controls provide greater ease of use. The diagnostic LED makes troubleshooting easier, which is further enhanced by the compatibility with the Harmony Listening Check for expanded troubleshooting. The Harmony Listening Check was featured in the last edition of ABInsight and is included in the Paediatric Harmony Patient Kits by default. The quick connect system makes changing ear hooks effortless and facilitates direct connection to today’s latest technologies and gadgets. For example, Harmony features the iConnect™, which provides a cable-free connection to the most commonly used FM systems in schools. Harmony can be worn fully on the ear with a comfortable behind-the-ear option that features a sleek and convenient design. For small ears and active lifestyles, it can be worn partially or completely off-the-ear using the new Harmony PowerCel™ Adapter or KinderClip™. Battery life with Harmony for C1.0 and C1.2 recipients was expected to be similar to the recipient’s previous processor. Advanced Bionics recommend the use of the PowerCel™ Plus with the Harmony for C1, which gives an average of 7 hours battery life. As the upgrade is performed using a simple change of programming software, most patients needed no change to their previous programs and quickly adapted to the upgrade. If you have a C1 generation implant and are interested in upgrading to Harmony, please contact your local cochlear implant centre for more information. AB proudly introduces the new and improved version of our fitting software; SoundWave™ 2.0. This new software was developed in close collaboration with clinicians to achieve a system that is innovative, fast and efficient for programming cochlear implant recipients. Bilateral cochlear implantation is becoming more frequent, with many countries now providing reimbursement for both the left and the right ears. SoundWave 2.0 provides many improvements for programming bilateral patients. For example, with this version, now both ears are managed within one patient file, allowing the clinician to accurately fit the M-levels across both ears, or adjust each side independently. SoundWave 2.0 also provides the ability to program a Harmony processor for recipients with a C1 implant. This upgrade brings many of the long-awaited benefits of Harmony to our first generation CI recipients, including improved aesthetics, connectivity and better front-end sound processing. Group mean results per questionnaire question. Black bars indicate a positive score where hearing with ClearVoice was judged as better than hearing without, whereas the light bar shows a negative score for hearing with ClearVoice. AB has been hosting Musical Atmosphere Interactive Days in many European countries as part of its (re)habilitation courses. Five experienced Harmony users, who had been involved in these sessions, participated in a EuropeanClearVoice and Music Evaluation Day. Black bars indicate a positive score where hearing with ClearVoice was judged as better than hearing without, whereas the light bar shows a negative score for hearing with ClearVoice. According to Brendel (2009) 1 and Schramm (2010) 2, the AB ClearVoice™ algorithm has been shown to significantly improve speech understanding for both adults and children in challenging listening situations, but what happens in relation to music? The aim of the Evaluation day was to examine listening to live and recorded music with ClearVoice. The workshop material included 21 musical extracts, which were carefully selected to cover a range of styles. Each piece was presented twice, once with ClearVoice activated and once without. The extracts compared important musical elements, such as the presence/absence of vocals, instruments used, tempo, dynamics, melody, accompaniment and emotion conveyed by the music. An eleven element questionnaire was completed for each extract immediately after the extract was heard for the second time and a valid response rate of 95.4% was obtained. Mean results showed an overall preference for listening to music with ClearVoice enabled. The music was found to be slightly quieter with ClearVoice; however the quieter parts of the music were still heard through the range and number of instruments. The emotional aspects of the music did not alter when listening with ClearVoice enabled. One of the key results was that melody was easier to detect when ClearVoice was enabled. Similarly, there were positive responses for detection of the presence of vocals and how well lyrics could be understood. The main conclusion was that the Users actually preferred listening to music with ClearVoice. This was a surprising finding as they were already highly positive about their experiences when listening to live and recorded music with HiRes 120™ sound processing. ClearVoice improved the balance between a solo and an accompanying instrument, which enabled the users to follow the melody with greater ease. Although it was reported that the music was quieter, importantly the key parts of the music were all clearly presented and the users found it easier to distinguish instruments. As might be expected, lyrics were easier to understand with ClearVoice. ClearVoice is a revolutionary technology designed to help recipients hear speech clearly. The algorithm operates by identifying non-speech sounds and reducing the gain in the channels where such sounds dominate, thereby enhancing speech discrimination. 1 Brendel M. C1 Harmony™ Sound Processor Evaluation - Final acute stage report. May 27th 2009. 2 Mulder H, Gault A, De Ceulaer G, Wolfe J. Advanced Bionics Cochlear Implants and Dynamic FM Technology; System Performance and Clinical Recommendations. Oral Presentation at the 11th International Conference on Cochlear Implants and Other Implantable Auditory Technologies, Stockholm, SE. June 30–July 3, 2010. Whilst in the UK to receive the most distinguished award in surgery, the prestigious Lister Medal, Professor Graeme Clark also visited St George’s Hospital London where he addressed a Cochlear meeting of surgeons. With an extraordinary gentleness and humility that surely signifies a truly great man, Professor Clark paid tribute to all those who have assisted him in his pioneering work in the field of cochlear implant technology and in his lifelong commitment to finding a solution for people with hearing loss. “I am very honoured to receive such a prominent award on behalf of all the researchers who are engaged in the fight against deafness,” he said. Professor Clark began his research in 1967. The first implant was performed in 1978 and was then developed commercially by Telectronics which became Cochlear Ltd. The first device for clinical trial was produced in 1982 and was given approval by the US Food and Drug Administration for use in adults in 1985. It was in this same year that the cochlear implant was modified and made smaller and more convenient for children and it was first implanted in a five year old. Professor Clark paid tribute to Cochlear™ as a company, which he says under the leadership of Paul Trainor of Telectronics in Australia just over 30 years ago had the vision, expertise and drive to take forward his ideas and bring them to the marketplace. Professor Clark’s research journey has not been easy he says, and he has always needed his ‘fighting spirit’ to convince people that hearing through electrical stimulation would be possible and that a device could be made safe enough to introduce under the skin. However, it wasn’t just the science that was so incredibly challenging, but also the constant need to raise funds for his research. At times, nearly half his working hours would be spent fundraising and he’s still having to fundraise to support his current research work. There are some things in life that are truly momentous: events, decisions or actions, after which life is never quite the same again. Like the moment when one decided to have a cochlear implant. Now there is the exciting opportunity for people who have received a Nucleus® 24 or Freedom™ Implant to upgrade and enjoy the benefits of the award winning Cochlear™ Nucleus 5 System. Cochlear Nucleus 5 sets a new benchmark in hearing performance and the clinical results experienced by upgrade users demonstrate benefits that make a real difference in daily life. Clinical results show the CP810 Sound Processor with Zoom processing offers superior performance in a range of noisy settings, compared to previous generation sound processors from Cochlear. The CP810 Sound Processor offers the industry’s first and only automatic phone detection, making it easier and more enjoyable to use the phone. The CR110 Remote Assistant is the first and only two-way remote assistant available, giving you complete and discreet control of your sound processors. The CP810 Sound Processor is designed for an active life which gives you the freedom to work up a sweat or relax by the water – and know your sound processor will keep working. Cochlear Nucleus 5 offers the smallest and lightest sound processor available in the industry today. Stylish, slim and sophisticated, it is ergonomically designed to fit ears of all sizes comfortably and discreetly.